Walter Sanford was born in Graveley, Huntingdonshire (now Cambridgeshire). He was one of 18 children born to Samuel Sanford, a farm labourer from Graveley, and his Yorkshire wife Sarah, née Fisher, from Holbeck, Leeds. The Sanfords lived at Church Lane, Graveley. On the night of the 1891 census, eight-year-old Walter was at home with his parents, Samuel 53, and Sarah, 49. Also in the family home were some of Walter’s brothers, Samuel, 18, James, 17, George, 16, and Fred, 14, all farm labourers, and sisters Annie, 11, Edith, 10, and Minnie, 6, who were all still at school, like Walter. Their father, Samuel, died in 1894, still in his fifties, and Sarah took on work as a charwoman. The 1901 census shows Frederick and Walter at home with their widowed mother and sister Amelia, 16. Walter and Frederick were both working as farm labourers. In 1911, Walter and Amelia were with their mother. Their brother, Benjamin, 44, a farm labourer, was also with them. All three were listed as single. The census reveals that Sarah, by then 69, had had 18 children, 17 of whom had survived. In early 1913, Walter married Lucy Margaret Swadling. Their marriage was recorded at St Neots, Huntingdonshire. Lucy was born in Remenham, Berkshire, in 1891, and also came from a large family. Her mother was from Huntingdonshire which may explain how Walter and Lucy met. The Swadlings, like the Sanfords, were farm labourers. In May 1914, before the war started, Walter joined the Huntingdonshire Cycle Battalion at their Headquarters in St Mary’s Street, Huntingdon, and became Private 1143 in A Company of the 2/1st Battalion. He gave his address as Offord Darcy, near St Neots, which suggests this is where he and Lucy were living after they married. The Huntingdonshire Cyclist Battalion was formed and began to recruit in February 1914. The county had previously had a Volunteer Battalion but in 1908, when the Territorial Force was established to provide home defence, this became part of the Bedfordshire Regiment. Many people were dissatisfied that the county no longer had its own regiment and in March 1913, the War Office granted approval to raise a wheeled battalion. Walter must have joined soon after the HCB was formed. It had several local drill stations including one at St Neots, and was attached to Eastern Command for use as mobile infantry, and for work on signals, scouting, and similar activities. The battalion remained in England throughout the war though many men were transferred to other regiments and sent to the Front. In July 1916, while the 2/1st Huntingdonshire Cyclist Battalion was at Well Camp in Alford, Lincolnshire, Walter was posted to the base depot of the British Expeditionary Force in France. He became Private 43058 of the 4th Battalion, Bedfordshire Regiment. The 4th was the ‘Special Reserve’ battalion of the regiment. After the disaster on the Somme in July 1916, the 4th was mobilised and sent to the Western Front. They landed in France on 25 July 1916 and joined the 190th Brigade of the 63rd (Royal Naval) Division, which had been transferred to Army Command. Not long after arriving in France, Walter was wounded in the leg by shrapnel. He was sent back to the UK, to a hospital in Bristol. 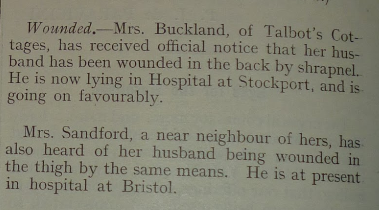 In October 1916, Datchet Parish Magazine, left, reported that Mrs Sanford had learned that her husband had been wounded. When he had recovered, Walter returned to the Front where his battalion was engaged in the Operations on the Ancre from November 1916 to early 1917, specifically at Miraumont in February. In April and May, during the Battle of Arras, they were heavily engaged at the Second Battle of the Scarpe, 23-24 April, when the Division captured Gavrelle. Walter was presumed killed in action during this offensive. The Bedfordshire Regiment website has published the war diaries of the 4th Battalion here. From these, we have learned what happened during Walter’s final days in April 1917. During the first week of April, the battalion was training at Manqueville, about 30 miles north of Arras. On the 8th, they marched some 12 miles to Maisnil-Les-Ruitz. They remained there on standby until 11 April when they were moved three miles further south to Hermin. They were again on standby until 14 April. From there they were taken to Arras by bus and they took over the line near Gavrelle from the 23rd Northumberland Fusiliers. The next day, 15 April, they were on reconnaissance duty. Two officers and 55 men were killed. From 16-21 April they were moved to the support line near Arras. On 22 April they were back on the front line, facing Gavrelle, where they occupied the assembly trenches. Their objective was, on the right, the boundary main road through Gavrelle to the far side of the village, and on the left, the Gavrelle-Oppy system of trenches, 200 yards north of Gavrelle. On 23 April 1917, the date Walter was presumed killed in action, they attacked at 4.45am, captured Gavrelle and reached their objective. The battalion was shelled very heavily during the day and counter-attacked in the afternoon. Several officers and 260 men were killed. Walter Sanford has no formal grave. He is remembered on Bay 5 of the Arras Memorial at Pas de Calais, along with almost 35,000 servicemen from the United Kingdom, South Africa and New Zealand who died in the Arras sector between the spring of 1916 and 7 August 1918, the eve of the Advance to Victory, and who have no known grave. Walter is also remembered on the Graveley Roll of Honour, and in Datchet. He was awarded the British War Medal and Victory Medal. We think that Lucy moved to Datchet to live with, or to be near, her family during the war. 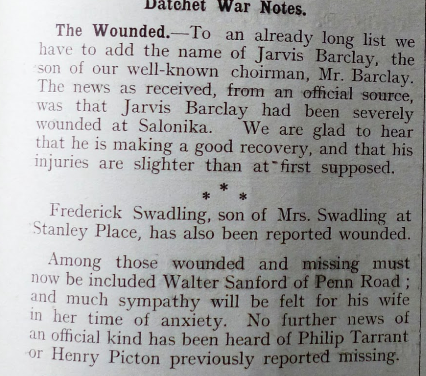 Lucy’s sister Maud, who had married William Johnson (another soldier remembered on Datchet’s war memorial) moved back to the Swadling family home in Stanley Place when her husband left for the Front. Two of their brothers, Frederick and Herbert Swadling, both served in WWI and survived. They lived at 2 Stanley Place and their next of kin was listed as their mother at the same address. The Swadlings or Sanfords are not listed in Datchet in Marshal’s Local Directory for 1910, nor do they appear in the village in the 1911 census. In 1946, Lucy remarried. Her husband, Gentie Elliott, also written as Gente Elliot, was the brother of Elizabeth Carrod, née Elliott. Her sons, Albert Edward Carrod and Henry Ralph Carrod, are also remembered on Datchet’s War Memorial. He died in 1959. When Lucy died in 1976, her name was recorded as Lucy M Sanford. There are many people of interest who served in the ranks and file of the 4th Battalion, including Hollywood actor and director Charles Laughton of the Hunts Cyclists and later the 4th Battalion of the Bedfordshire regiment.